I am returning Assembly Bill 1147 without my signature. I appreciate and applaud the Legislature's interest in actually expanding California's economy; however, I am concerned about the impact of the particular type of expansion that is being proposed. I recognize and am proud of that fact that California is a national and world leader in the production of high-quality agricultural commodities. Our state has a rich agricultural environment and we must strive to protect and promote farming, ranching and agri-business in California, while preserving natural resources and protecting consumers. Given these facts, I would like to support the expansion of a new agricultural commodity in this State. Unfortunately, I am very concerned that this bill would give legitimate growers a false sense of security and a belief that production of "industrial hemp" is somehow a legal activity under federal law. Under current federal statutes there is no definition of "industrial hemp" nor is there a distinction between cannabis plants based on Tetrahydrocannabinols (THC) content as delineated in AB 1147. In fact, under federal law, all cannabis plants, regardless of variety or THC content, are simply considered to be "marihuana", which is a federally regulated schedule I controlled substance. Any person in the United States that wishes to grow cannabis plants for any purpose, including industrial purposes, must first obtain permission and register with the U.S. Drug Enforcement Administration (DEA). Failure to do so would be a violation of federal law and could subject an individual to criminal penalties. I understand there are several court decisions that may cloud this issue such as Hemp Industries Association v. DEA, 357 F.3d 1012, 1018 (9 th Cir.2004) and United States v. White Plume, 447 F.3d 1067 (8th Cir. 2006). Yet, no court has specifically ruled that a live cannabis plant is a non-controlled substance or that farming these plants is not a regulated activity. As a result, it would be improper to approve a measure that directly conflicts with current federal statutes and court decisions. This only serves to cause confusion and reduce public confidence in our government system. Finally, California law enforcement has expressed concerns that implementation of this measure could place a drain on their resources and cause significant problems with drug enforcement activities. This is troubling given the needs in this state for the eradication and prevention of drug production. In the future, I would encourage the Legislature to work with state and federal law enforcement agencies to craft a measure that would reduce the burden on law enforcement agencies and would comply with federal law in order to avoid the unnecessary prosecution of unwitting individuals in this state. Progressive Grocer announced on Friday the recipients of their 2006 Editors Pick awards. "New products are the lifeblood of grocery retailing," said Stephen Dowdell, editor in chief of Progressive Grocer. "At the same time, grocery buyers get flooded with tens of thousands of new product alternatives each year, and many innovative items can get buried in the pile as a result. Here, in the opinion of the experts at Progressive Grocer, are some of the standouts that are worth a closer look." French Meadow Bakery was one of the three Editors Picks in the Dairy category with their Healthy Hemp Tortillas. On September 1st Progressive Grocer wrote "Tortillas are now a staple for any grocer, not just those catering to Latino customer bases. 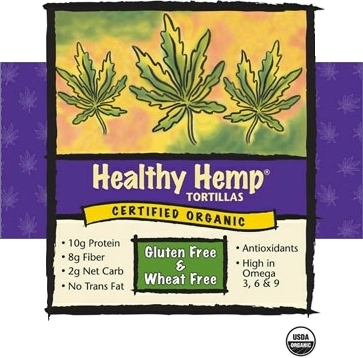 It makes sense to mix them with the latest in healthy baked goods trends, as in this product, Healthy Hemp Tortillas. These press all the hot buttons: gluten-free; wheat-free; certified organic; an excellent source of omega-3, -6, and -9, thanks to the hempseed; and not a carb bomb at just two net carbs per serving. The toasted sesame has a nutty kick, to boot." REGINA, SASKATCHEWAN - September 12th, 2006 - The Canadian Hemp Trade Alliance/Alliance Commerciale Canadienne du Chanvre (CHTA/ACCC) is hosting its annual industry conference – The Hemp Summit – in Winnipeg at the Greenwood Inn on Nov. 17, 2006. "This has been a significant year for industrial hemp in Canada," says Arthur Hanks, Executive Director, CHTA. "We have seen Canadian field acreage climb to an estimated 35,000 acres, corresponding with increased consumer demand for healthy hemp foods. In addition, we are seeing the beginnings of a fibre processing industry which will lead to another boost in production. In the U.S., states such as California and North Dakota are moving closer to the day they will establish hemp as a viable crop, which will usher in a bold new era for the sector. This year's conference will bring all these themes together." Top industry marketers, food and fibre processors, agronomic experts and hemp researchers will come together at the conference. Manitoba's Deputy Premier and Agriculture, Food and Rural Initiatives Minister Rosanne Wowchuk will welcome participants from across Canada and the U.S. to the conference, where marketing and product innovation will be a major theme. One of the sessions highlighting this theme includes a presentation by Lynn Gordon, founder and President of French Meadow Bakery headquartered in Minneapolis. French Meadow Bakery ships bread all across the continent and Gordon will discuss her company's recent successes with diversifying into hemp products. A complete line-up of speakers will be announced the week of Sept. 18. According to Hanks, the CHTA annual conference creates opportunities for entrepreneurs, farmers, businesses and scientists involved in the Canadian and North American hemp industry. "Networking opportunities are crucial in any emerging industry," says Hanks, "The Hemp Summit will be our largest conference ever and will be an excellent opportunity to share industry challenges and successes." Early registration for the conference is now open. Participants who register before Oct. 1 will pay the early registration fee of $75 for CHTA members and $100 for non-members. For membership inquiries, see our online form at http://www.hemptrade.ca/en/members/sign-up.ihtml. Sponsors to date include: Manitoba Trade and Investment, Hemp Oil Canada & Manitoba Harvest Hemp Foods & Oils. 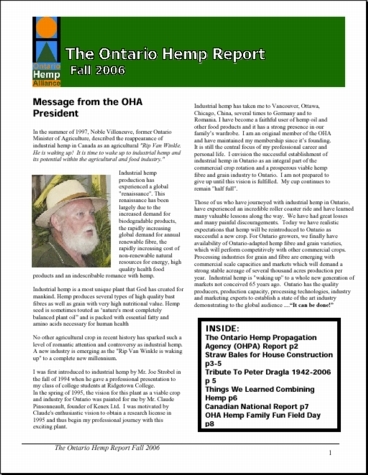 For more information about The Hemp Summit, CHTA/ACCC and hemp in Canada please see our web site at www.hemptrade.ca. The CHTA is a non-profit industry association whose mandate includes market development and advocacy, information creation and distribution, and research. Established in 2003, the CHTA represents hemp processors, marketers, farmers and researchers. Membership is open to all companies active in the Canadian industrial hemp sector. Hemp is our business. For more information about the CHTA/ACCC and hemp in Canada please see their web sites at http://www.hemptrade.ca and http://www.infochanvre.ca. 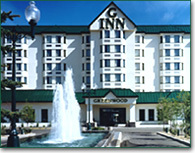 The Greenwood Inn http://www.greenwoodinn.ca/winnipeg/home.html is located at 1715 Wellington Avenue, near Winnipeg International Airport (code YWG).